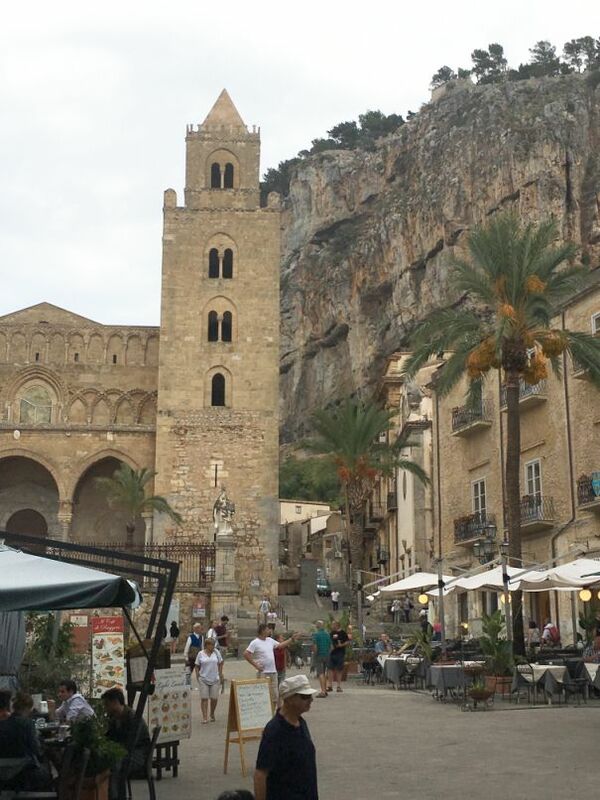 Once we are done with Monreale, we hopped in our car and drove for about 90 minutes to Cefalù. 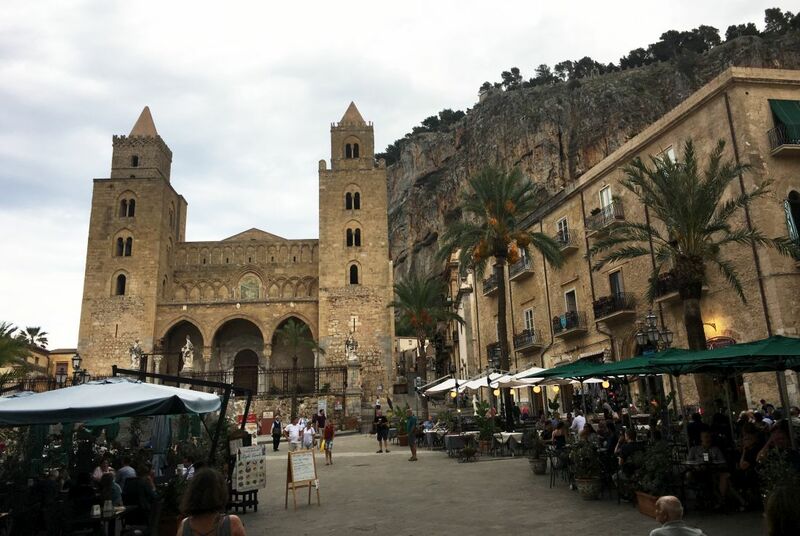 Cefalù is a small town known for sandy beaches, winding Medieval streets flanked with shops, and also for the majestic cathedral and its glorious mosaics. 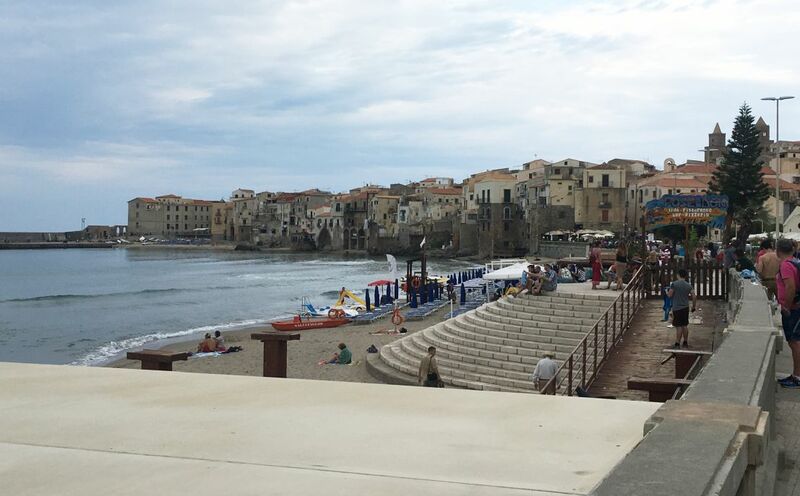 We found a parking spot right on the main street leading to the sandy Lungomare beach stretching alongside the town. It is very busy in the peak summer months of July and August but it is late September now and lucky for us, most of the tourists are gone. 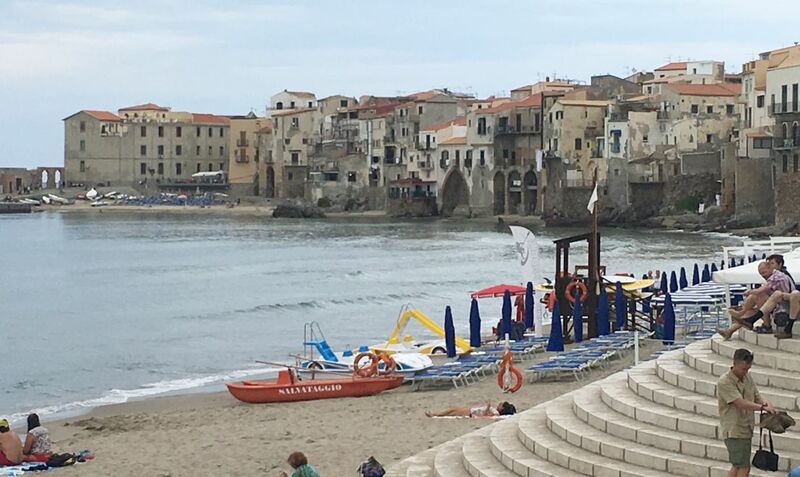 View of the beach and the old town in the back ground. It’s a popular beach with families due to the shallow waters and lifeguards on duty. 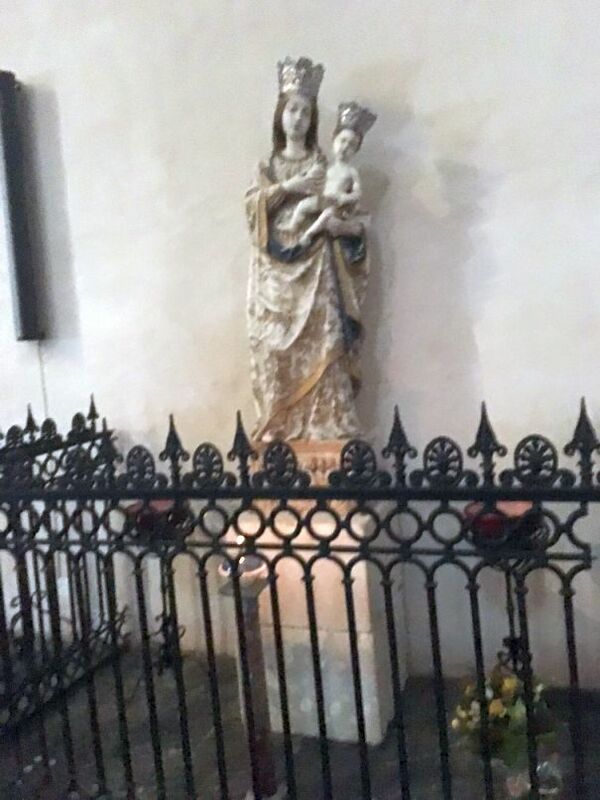 During July and August it can be very busy. 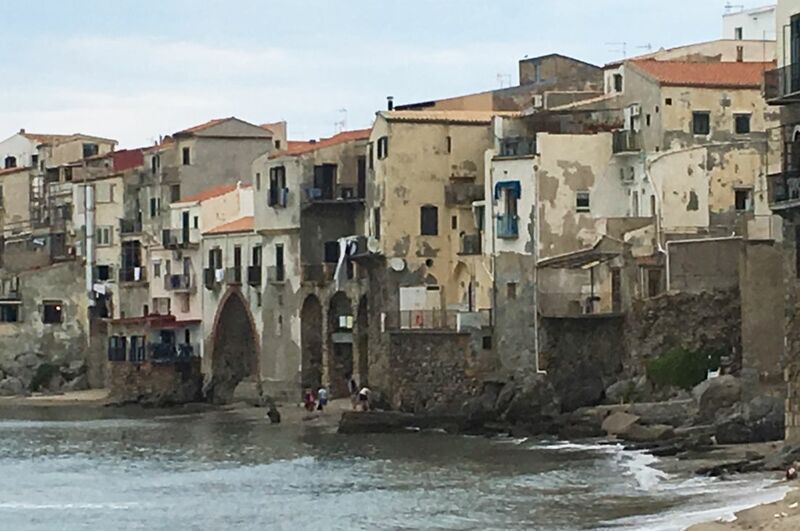 Close look at the old town - view from the beach. 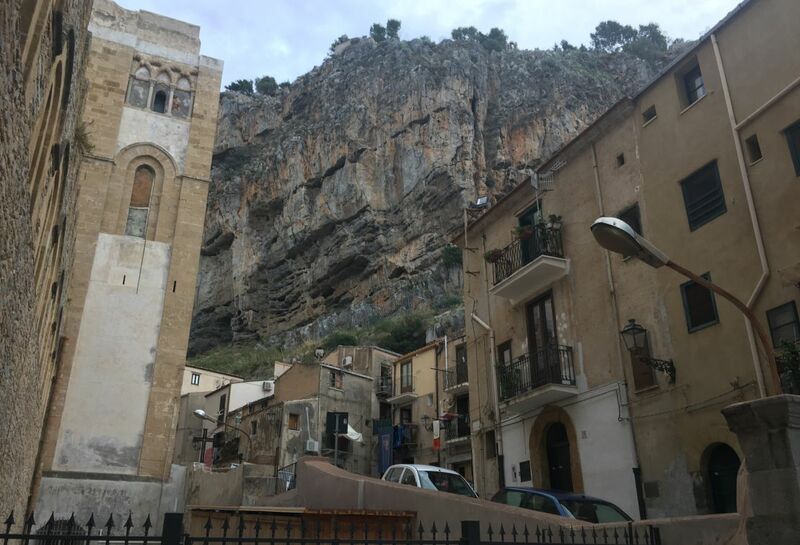 The massive rock you see in the back ground is called la Rocca mountain. 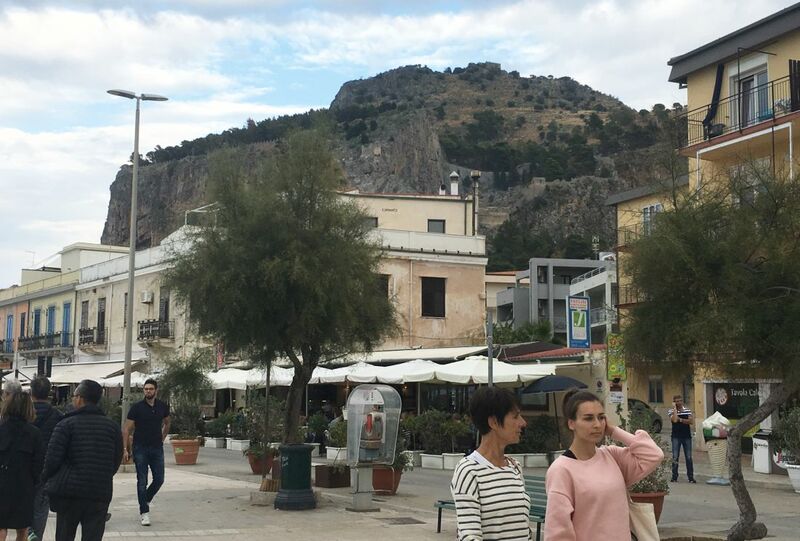 La Rocca is the head-shaped rock that gave this coastal town its name when the ancient Greeks first landed there. 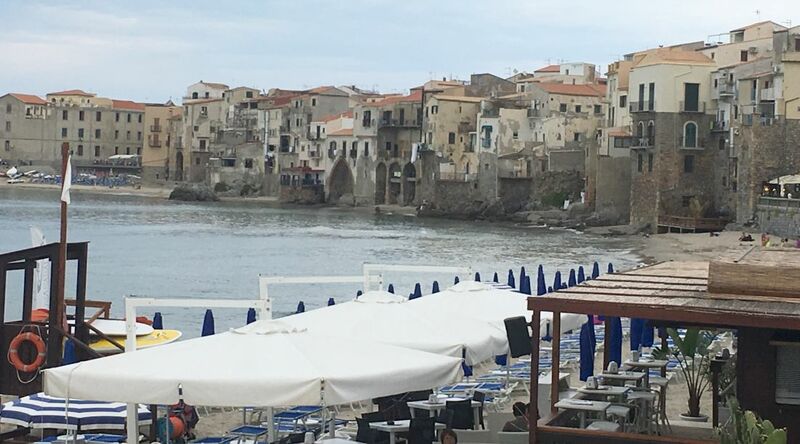 Cefalu is thought to derive from the Greek word kephale, meaning head. 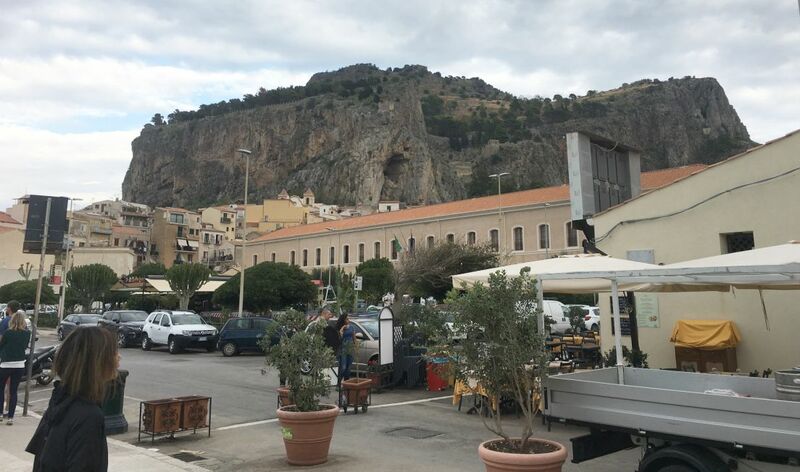 La Rocca sits above the town, the climb to the top of this hill is dotted with ancient Greek remains and the views when you get there are breathtaking so we were told. To get to the top you have to undergo an exhausting hike, but we decided to skip it... Don't think our knees will handle the hike to the top. 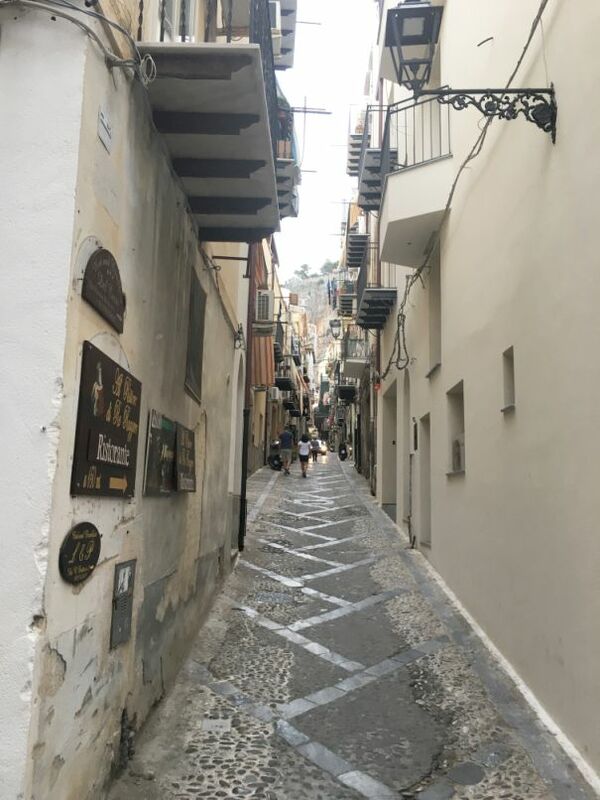 Small streets in the medieval town leading to the cathedral of Cefalu. 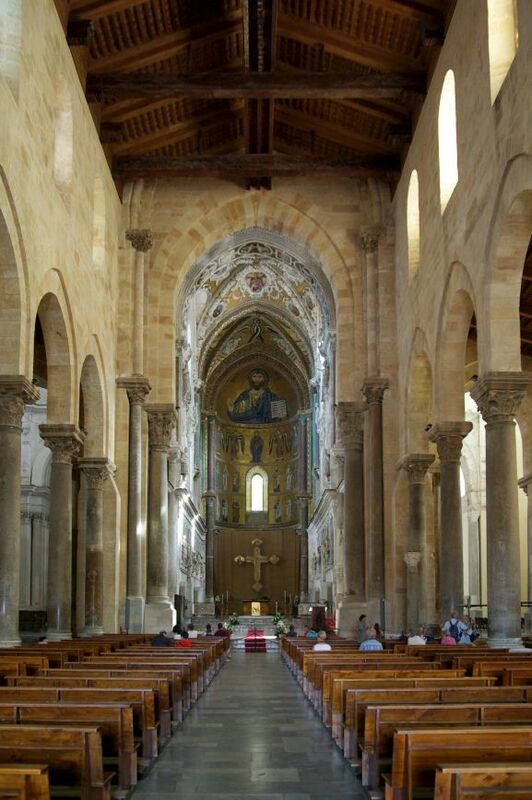 The town's main claim to fame is its Norman cathedral located in a square toward the seafront. 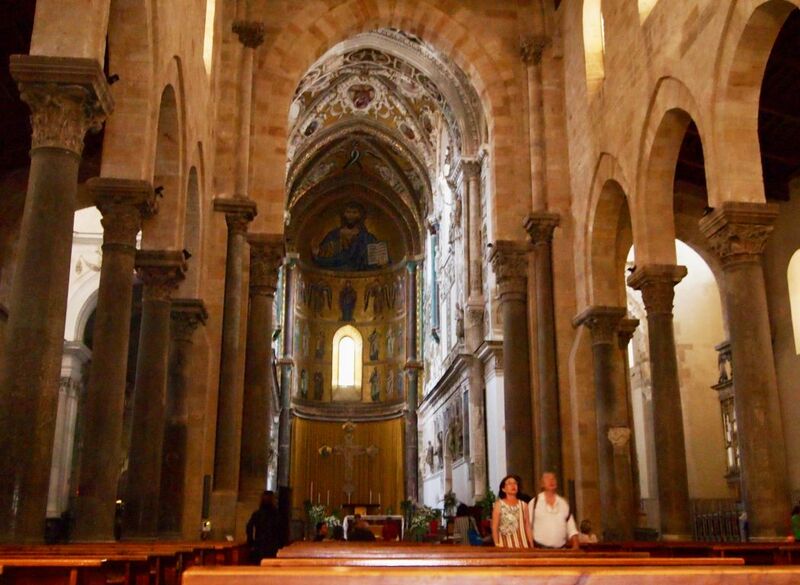 The cathedral of Cefalu represents Roman style with Islamic, Norman, and Byzantine elements. 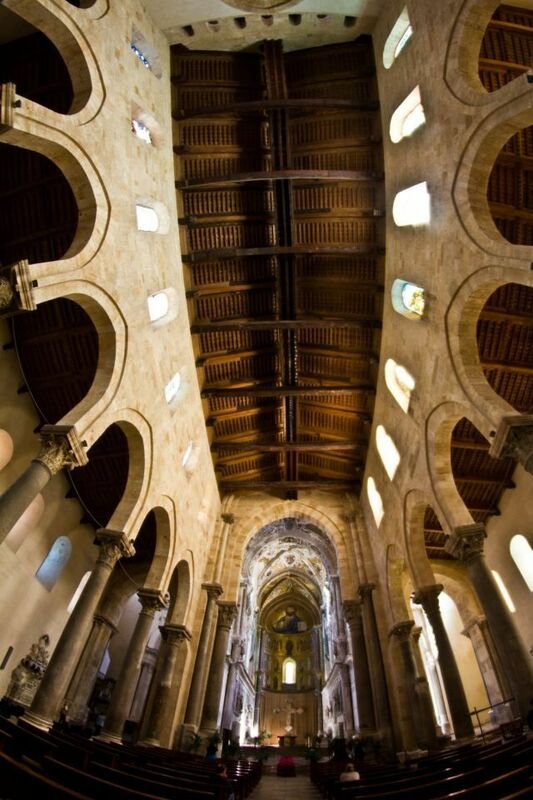 The cathedral was built on the orders of the Norman King Roger II, which work started in 1131. Building took placed in stages with the core completed in Roger's time and additions made during the reigns of Williams I and William II. 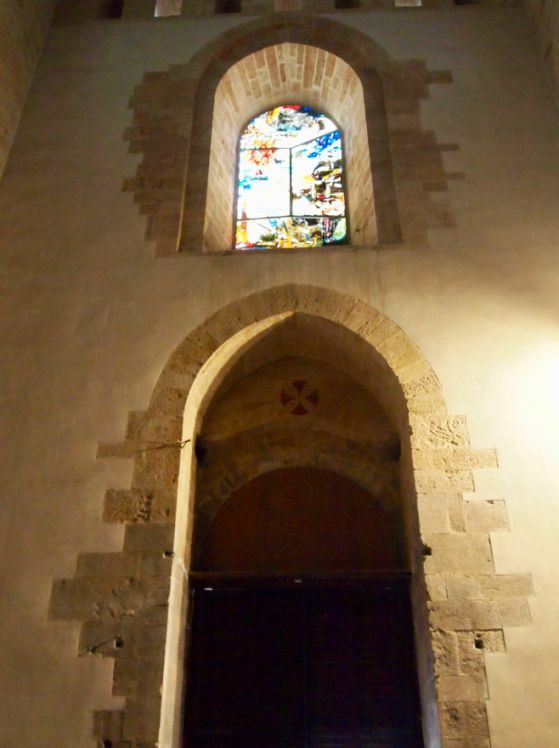 The towers in the front facade were added in 1240. 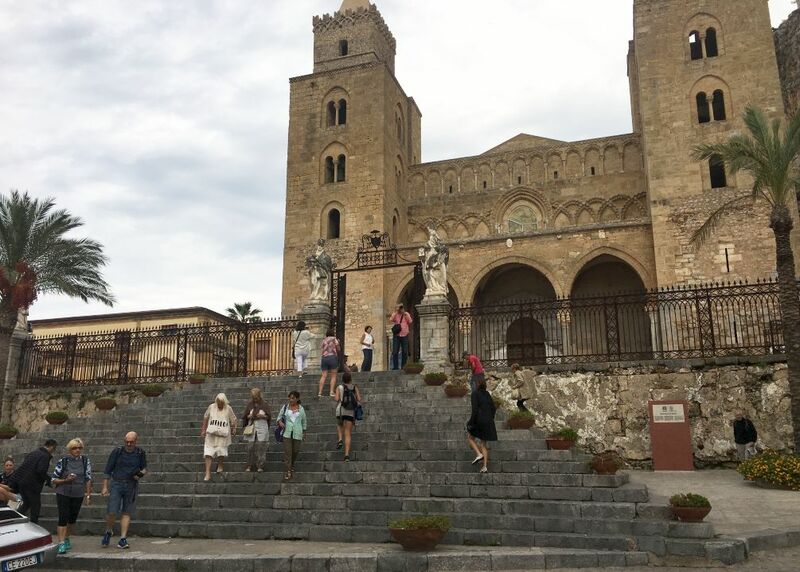 The cathedral stands in high ground at the fare end of the town's main square, just below the Rocca and with its towers visible from miles around. 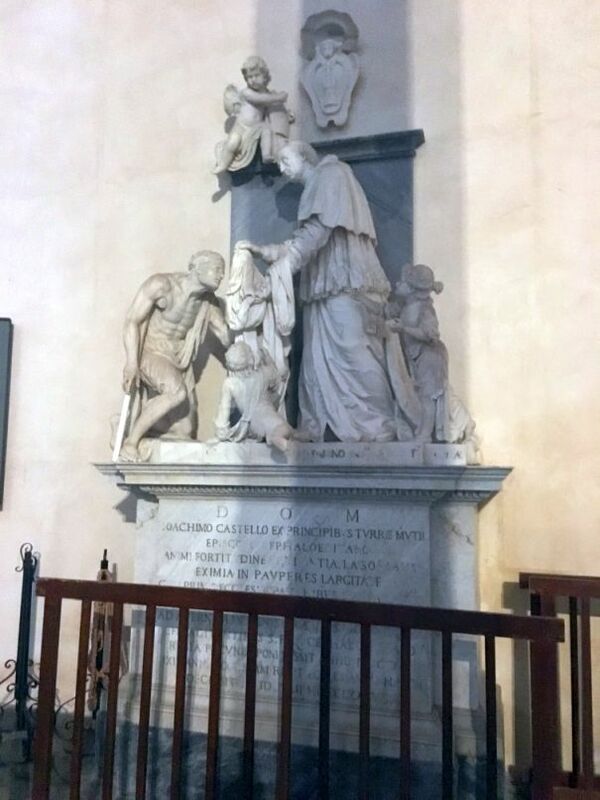 In common with other medieval churches the cathedral has a founding legend. 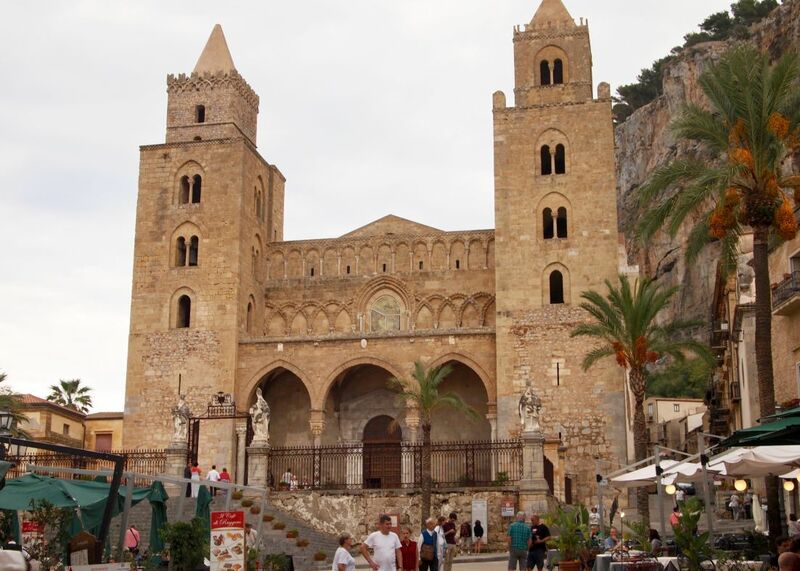 The King of Sicily, Roger II, erected the Cefalu Cathedral as a way to fulfill the promise he made to the Holy Savior. 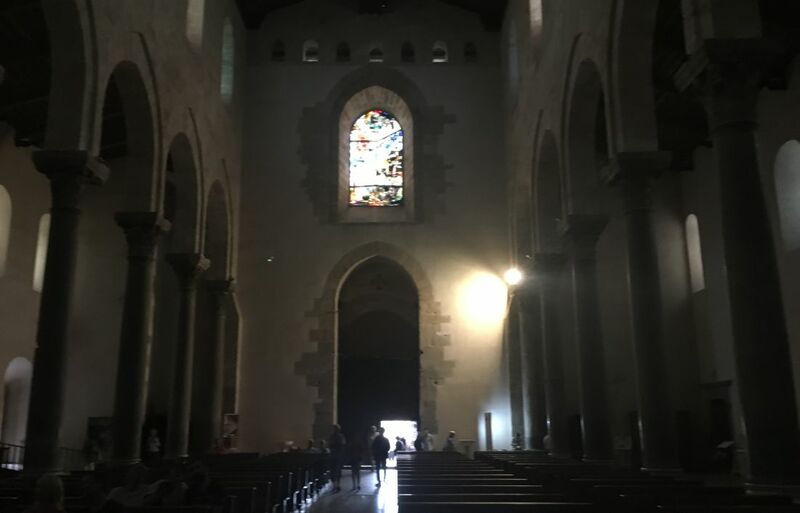 After being trapped by a storm on the sea, he promised to build a church on the place he could safely land. 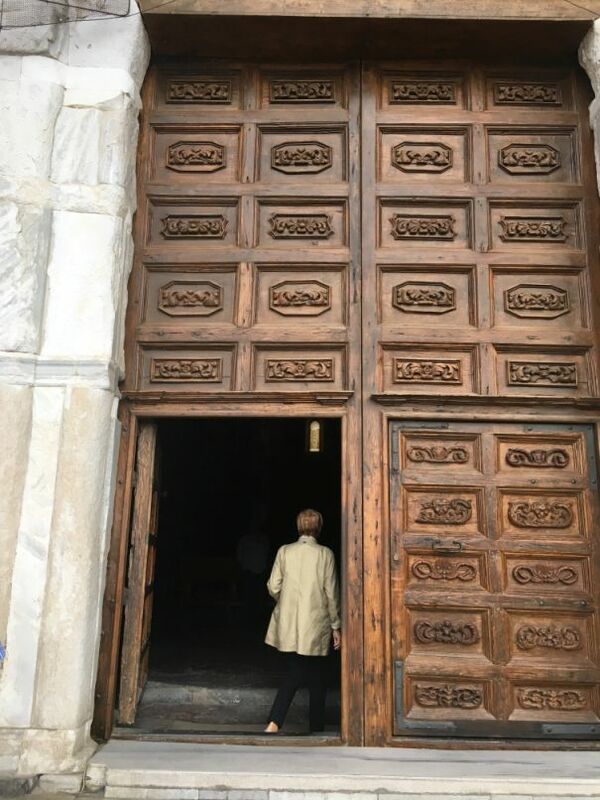 He managed to escape the storm and arrived at Cefalu's beach where the king placed the first stone of this impressive building. 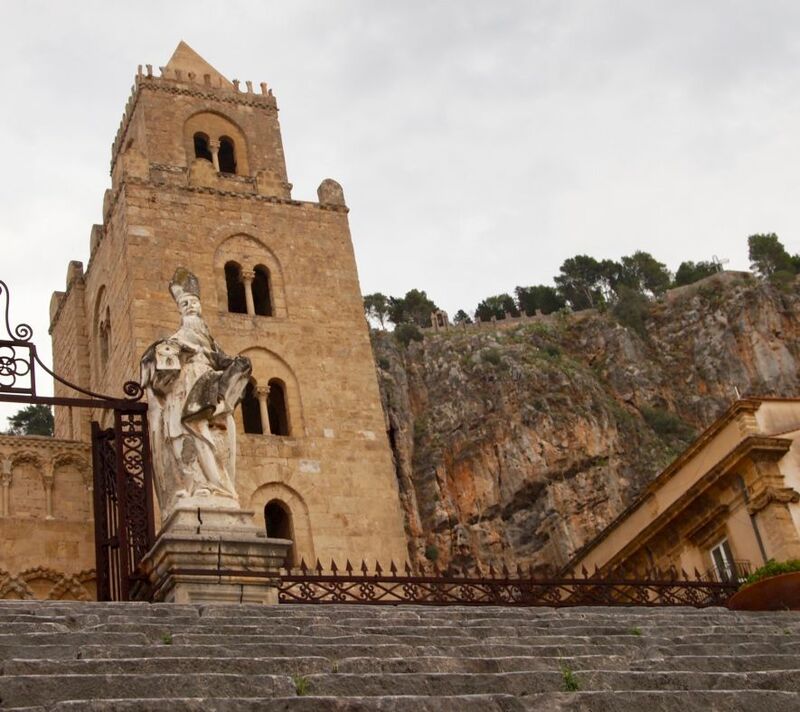 The Cefalu Cathedral was built to fulfill the king's promise, to demonstrate the power of the Normans in Sicily, and to defend the town in case of an invasion. 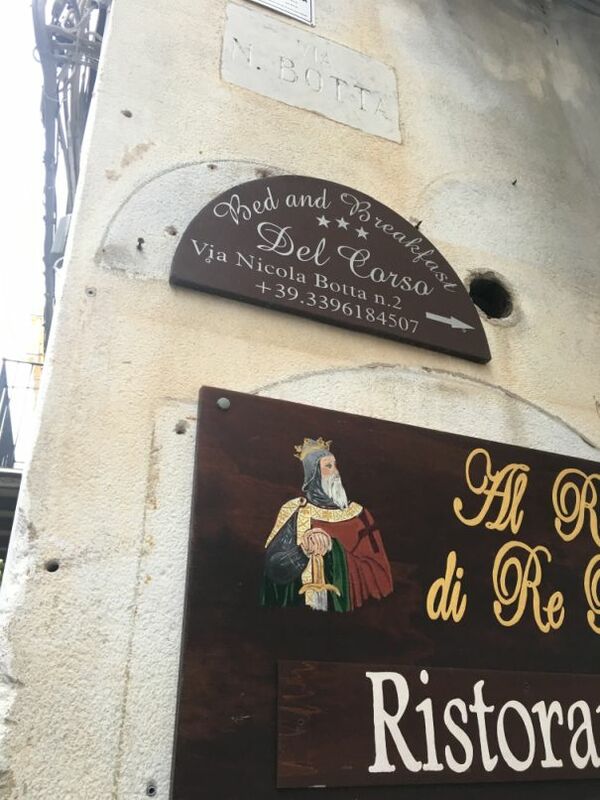 This is why the building almost has a military appearance and is located in a place where it very visible in the town. 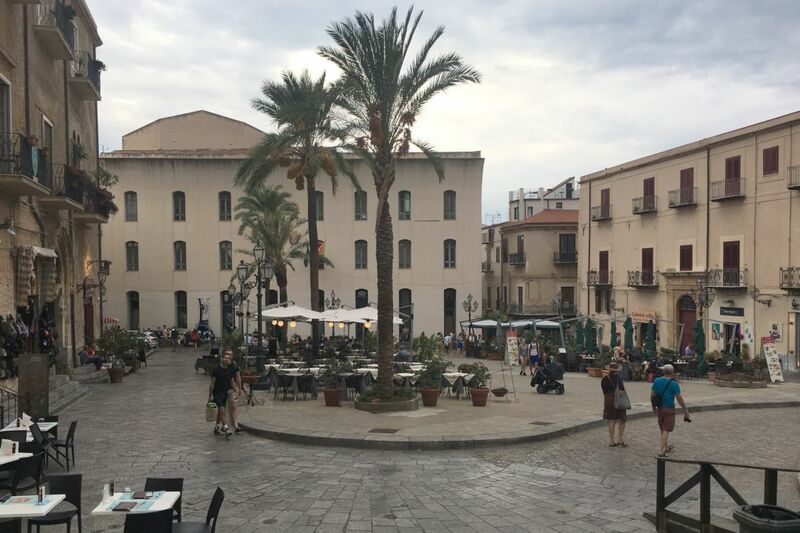 The square in front of the cathedral and the stairway were built over the old cemetery. 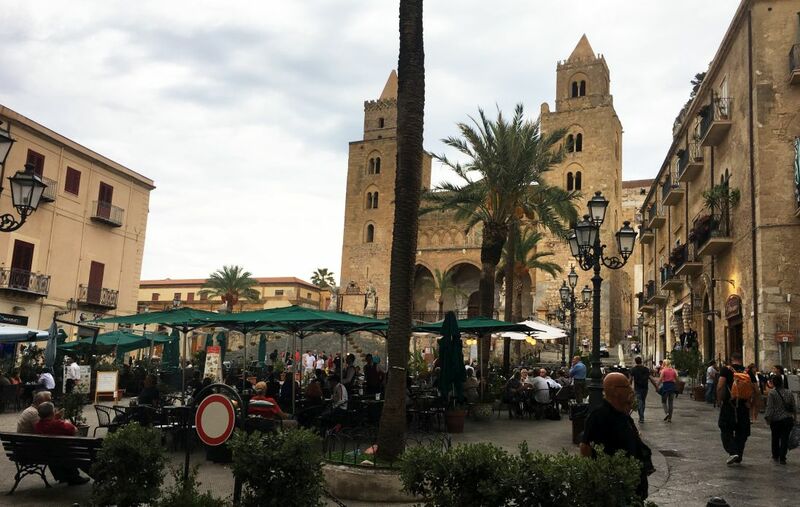 Locals said that the square in front of the cathedral was created with earth brought from Jerusalem. 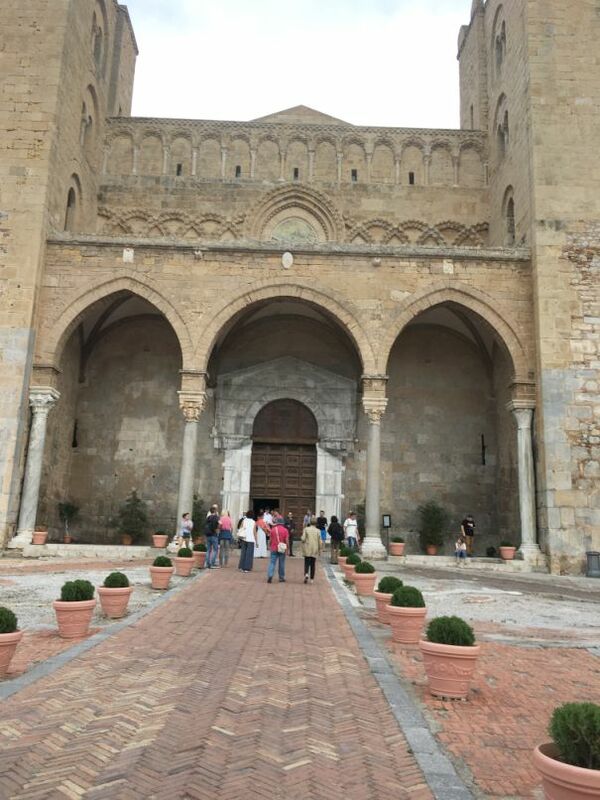 The cathedral is dramatically situated in front of the mountain La Rocca. What a view! 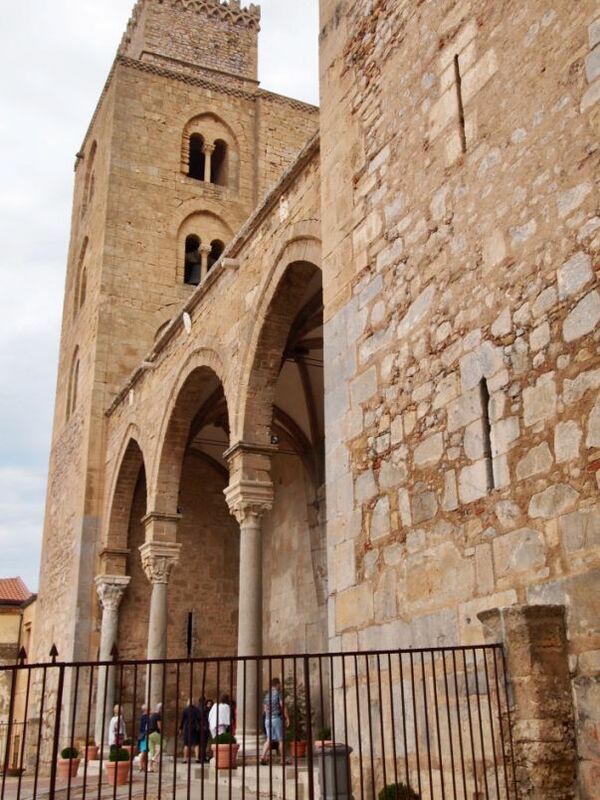 The 15th-century portico has three arches, the two outer being pointed, supported by four columns and vaulting ribs. 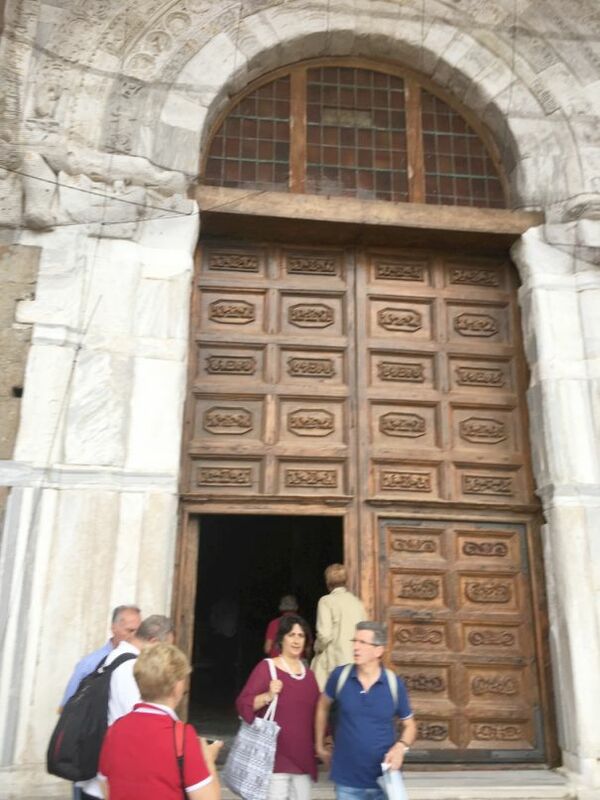 Under the portico is the Porta Regum (Kings' Door), with a finely decorated marble portal. 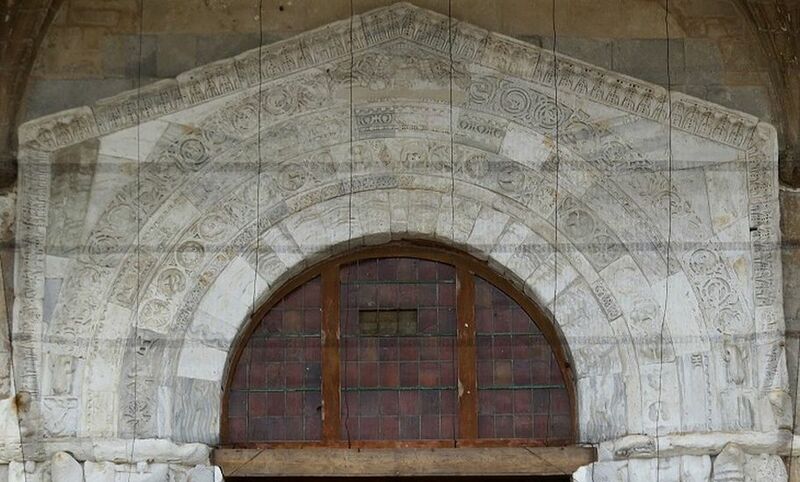 The building's interior is decorated with lovely mosaics created by twelfth-century Byzantine artists. 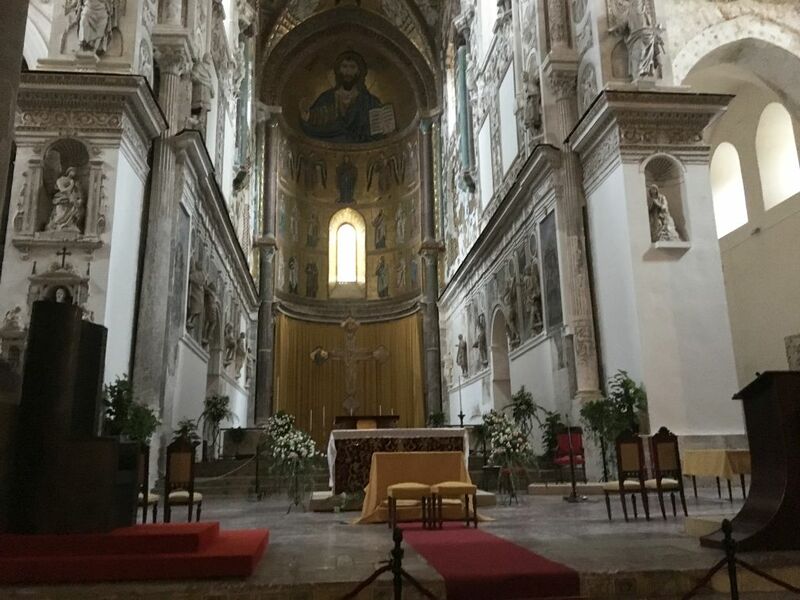 In the center nave a large Christ Pantocrator on a gold background dominating the apse, above the Madonna, archangels and Apostles. 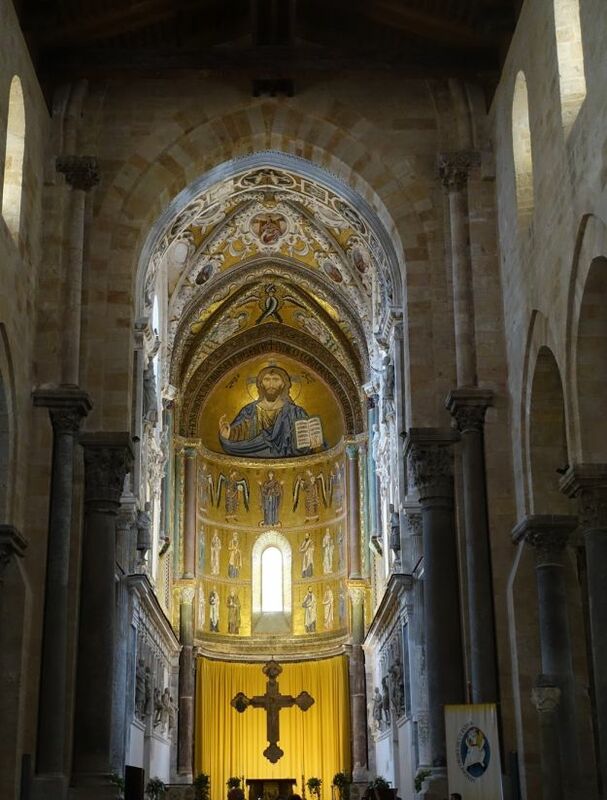 The interior of the cathedral has received many additions, especially in the baroque era but remains exceptions for its mosaics. The figure of the Christ Pantocrator (from the Greek for "almighty") which according to an inscription was completed by 1148, is magnificent. 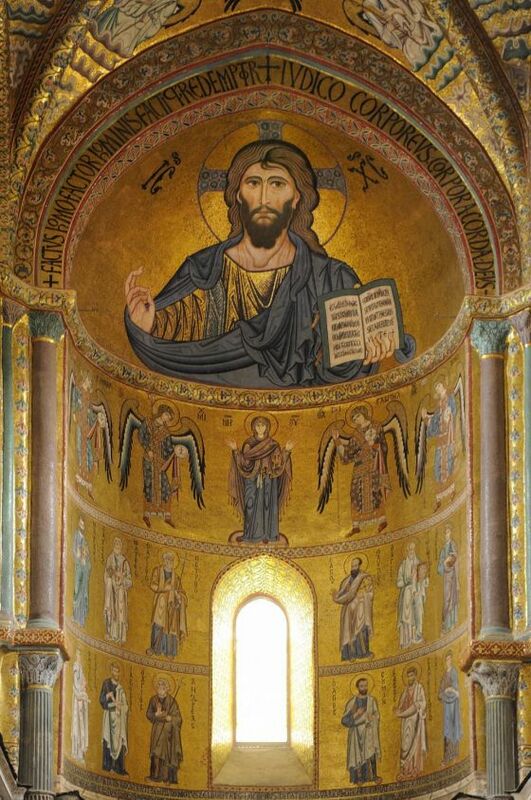 The fist thing I though of as soon as I walked in the cathedral was that the mosaics of Christ Pantocrator is very similar to the one in the Monreale cathedral. 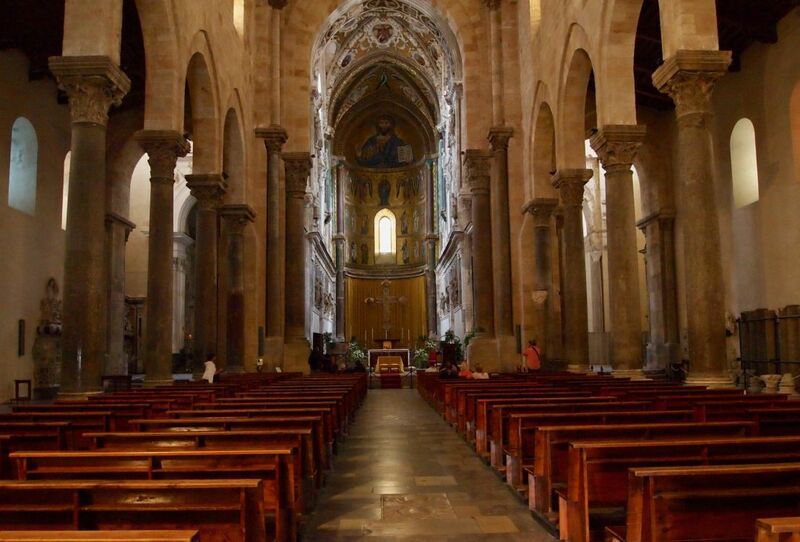 However, this cathedral is smaller than the one in Monreale. 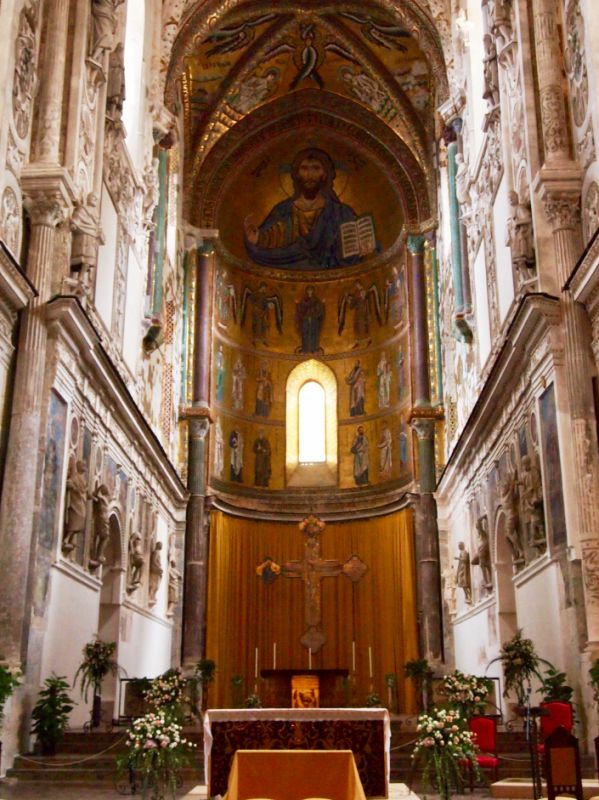 Mosaics depicting the Christ Pantocrotor(all mighty), above the Madonna flanked by archangels, and below tow rows of Apostles. 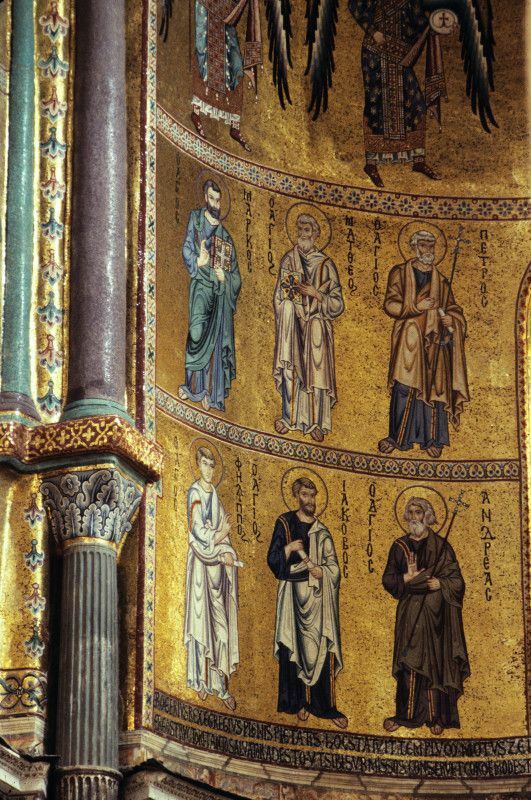 The mosaics which predate those of Monreale by 40 years show a portrait of Christ against a glittering gold background with his hand in a gesture of benediction and his left hand holding an open bible. 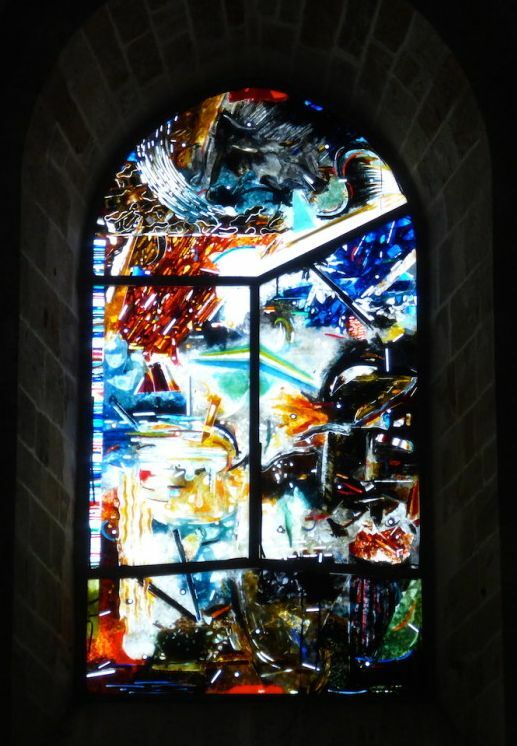 Close look at the mosaics. 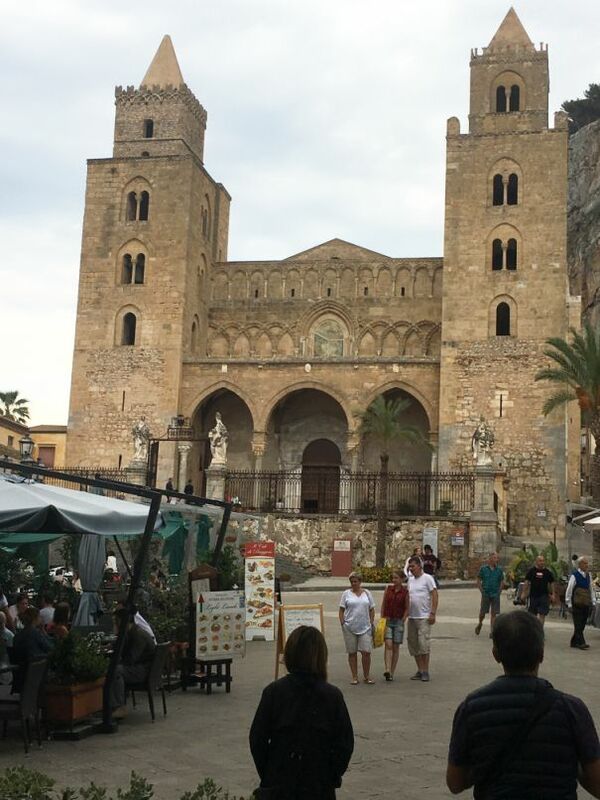 Imposing view from the square, the end of the cathedral is on the left and in the middle is La Rocca. View of the square as we are leaving the cathedral.